What are lift chairs? A power lift chair gently raises you from a sitting to standing position, which makes more than just a comfortable chair, but an indispensable asset for getting around each day without assistance. Who will benefit from a lift chair? Anyone with difficulty getting in and out of a chair stands to gain from a lift chair. This benefit is amplified for those with hip or knee troubles as lift chairs can reduce the strain needed to get out of a chair, especially with recliners. What should you consider in a lift chair? Making sure the lift chair fits the person meant to use it is extremely important. If your feet do not meet the floor when sitting in the chair, you will not be able to use the lift function safely. Make sure that your feet meet the floor, the seat is wide enough to support you comfortably, and the top of the headrest is a couple inches above where your head meets the cushion (for proper head support). Weight capacity is also an important factor, as chairs for heavier occupants need extra reinforcement to guarantee the occupant and the chair are safe from harm. A lay-flat chair reclines to a horizontal sleeping position, and is sometimes available with an innerspring coil cushion for additional support. A bed chair comes to a full sleeping position like a lay-flat, but can be customized by removing the back and chaise cushion and adding an optional mattress to the chair. When confined to a chair for long periods of time, it can be difficult to get comfortable. This is especially a problem for those suffering from conditions in which they experience chronic pain. Ask your doctor or chiropractor if elevating your legs or easing spinal tension with a zero-gravity recliner are effective pain management methods for you. Chairs with zero-gravity recline, for example, have been shown to be effective in some cases of chronic lower back pain. This is the standard model of lift chair. It's best as a tv chair or daytime chair, and not meant to be occupied for long periods of time due to its limited range of motion. 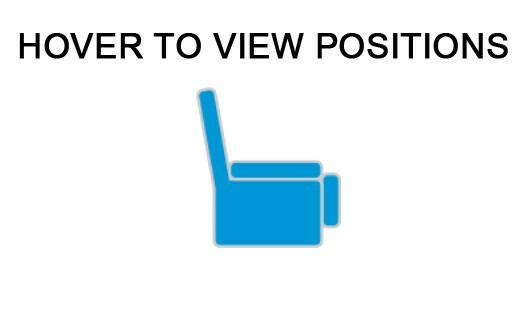 A 3-position chair can be used for longer periods because it reclines further back into a "napping" position. But these chairs don't normally recline to a completely flat position, so they aren't recommended to sleep in at night. The most comfortable and versatile lift chair option. Reclines to a completely flat position and sometimes is available with a mattress add-on. The seat cushion drops back and rises in the front to align the hips. This is meant to minimize muscle tension and reduce pressure on the spine. Premium lift chairs give you the choice of additional options like a leather or stain-resistant performance fabric cover option. Some even offer remote-controlled heat and massage! Inquire with your helpful furniture salesperson to see if any of these add-ons are available. Additional charge may apply.